I was on my way to the last school for the day, San Remegio Elementary School at Kaputian District in the Island Garden City of Samal (IGACOS). This was my first time to visit the school since the start of the SBMC-CoRE (School Based Management and Community Collaboration on Reforms in Education) project implementation in IGACOS. Before my scheduled visit, I tried to contact the principal several times to invite him to attend the orientation. Unfortunately, there was no response from him. I was told that communication signals were at best intermittent within their locality. My heart sank. I was disappointed that classes continued under these conditions. Although I’ve heard of classes held under the mango tree and multi-purpose gyms -- those remained stories, until now. It was clear that classroom shortage was a reality. Looking at them, I wondered whether they’d be able to listen, learn, and understand their lessons. How were they able to write properly on their notebooks with no writing tablets? How can they think clearly if they were squeezed together? Their teacher mentioned that even if it rained, classes continued. This has been the condition for so long that teachers and students were used to it. To make things worse, this class shared only four books among themselves. Fortunately, this school was included in the next BEFF (Basic Educational Facilities Fund) project for 2012. This means that they would be a recipient of a new school building and armchairs. 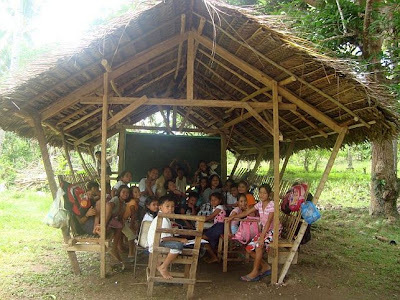 This would provide them with a better learning environment for the children. This is why I was happy to be part of the SBMC-CORE project. This project has provided me with the opportunity to reach out and help communities such as this – for they deserve more for the future of their children. Ms. Yolly Vicente is the area manager of IGACOS for the PH Desk of ANSA-EAP.